Welcome to la familia! Father, mother, abuelita. The fifties kitsch of Familia introduces readers to a family just like theirs. Welcome to the Family! It’s just like yours: father, mother, sister, brother, abuelita, gato. Well, there’s something just a little bit different about this family. Maybe it’s those clothes they wear … just a little bit fashion backward. And the colors! So vibrant and … lively. Maybe that’s what it is. They are just so full of life. Familia-life. Oaxacan folk artist Zárate creates papier-mâché sculptures of Day of the Dead–style skeletons that grin widely as a young skeleton named Anita introduces her family…Zárate’s sculptures exude personality. Though they are skeletons, this family couldn’t be friendlier … The details traditional Oaxacan artist Canseco Zárate includes charm as fully as Weill’s crunchy vocabulary … They may be dead, but their affection is palpable. 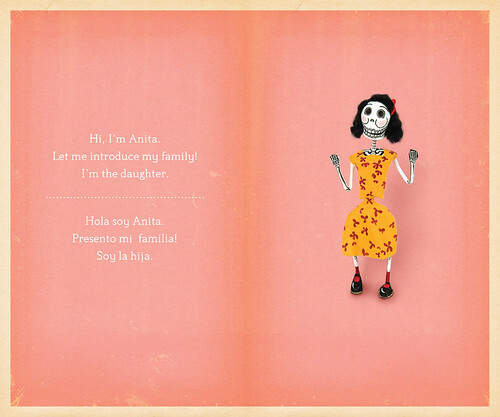 Just right for the Day of the Dead or for a fresh take on family structures—tan lindo! The photographed Oaxacan folk-art figures will make readers smile as each one has a fixed grin, as one would expect from a well-dressed skeleton … This book would be a welcome and culturally relevant addition to beginning-reader collections. For a bilingual, bicultural experience with a little macabre slant, read Mi Familia Calaca / My Skeleton Family with your elementary school student or child. Mi familia calaca / My Skeleton Family is great fun for the youngest children — both hablantes and English speakers — and can lend itself to a plethora of art projects during celebrations of El Día de los Muertos, and any other time as well. Highly recommended.